Sometimes, you need a good wing-woman. 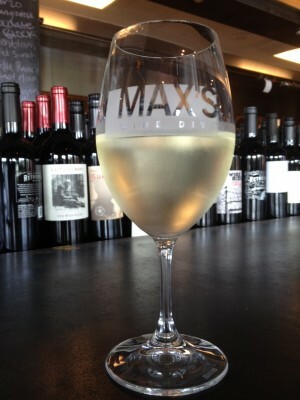 And SOMETIMES, that wing-woman is Max’s Wine Dive. Listen, first dates are stressful. #speakingfromexperience You have to decide on a great place, choose the perfect outfit, have a glass of wine to get “loosened up” (LOL) ALL to impress someone who you may NEVER see again. UGH! The agony!! Here is my Suggestion – go to Max’s! Let me tell you, it has been a while since I stepped foot into this dive, however there was a time that I would go regularly. I don’t know why this changed, but I’m glad I took the initiative to schedule a date there recently. The lighting is at a perfect dim setting, which makes the environment very cozy and relaxing. They also have local musicians that play every Monday – a very nice touch that I never knew existed! Of course, the highlight at Max’s is their wine list. They have a large selection of various wines from around the world. Luckily, my order is always pretty simple – “I’ll take a Pinot Grigio, please!” This time I ordered the WillaKenzie. It is a tasty Oregon wine that is smooth and crisp. I liked it so much that I ordered two glasses! YUM. 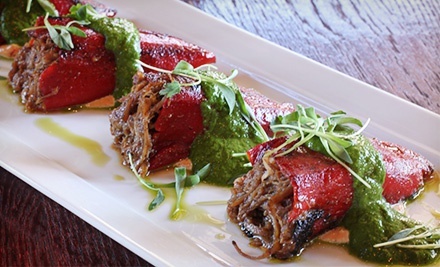 If you are in the mood for an appetizer, you must try the Pulled Pork Stuffed Peppers (pulled pork and cotija-stuffed piquillo peppers, chipotle aioli and cilantro chimichurri) – they are REALLY delicious and pair perfectly with your beverages! Need something heartier? I would recommend the Pan Borracho (“drunk bread”) – one of their signature dishes that includes: torn sourdough baguette, prosciutto and fresh thyme soaked in a savory white wine custard and baked with Gruyere, mozzarella, provolone and Parmigiano-Reggiano. The flavors are crazy-good! It’s pretty amazing! #justsayin The good news here is that whether your date is a total bust or not, at the very least, your taste buds will be satisfied. I call this a WIN! The Sandbar Fish House & Market = PERFECTION!